Patagonia is a mecca for the restless. Transcending borders and time, it’s a place where granite summits destroy egos, where sunsets look like melting sorbet, and where windburnt hikers toast beers to clean underwear. In March of 2018, I left my job to compete at a trail racing competition in Patagonia called UltraFiord. I packed my backpack, made no reservations or plans aside from the race, and (3 flights and 1 bus ride later) I ended up at the doorstep of Torres Del Paine National Park in a small backpacker's paradise called Puerto Natales. 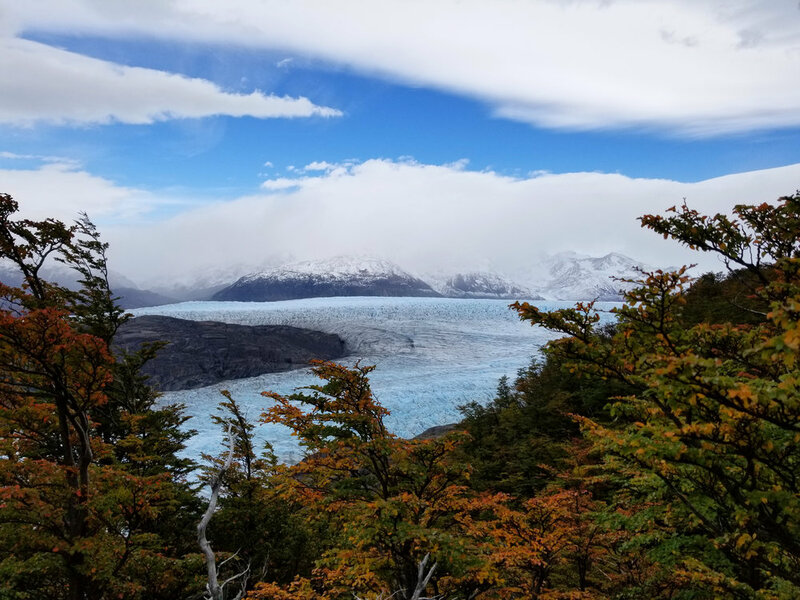 Overflowing with quirky hostels, hippie cafes, friendly street dogs, and wanderlusting souls, Puerto Natales is the central hub for all things Torres Del Paine. The vibe in town is backpacker meets hygge: it's a place where everyone wears cosy wool sweaters and thick boots. Where dressing up means putting on jeans. Where hot chocolate is the only acceptable beverage order. Where brisk ocean breezes and freshly baked bread inundate your senses. And where the usual topic of conversation is what color the Torres towers were the day you summited or how strong the wind was on your W trek? I spent the majority of my time in Puerto Natales tapering for the race, strolling along the waterfront, stopping in cafes to write and work on my designs, and dreaming up adventures for the rest of my 2.5 month trip. After the race (an epic shoe-sucking mud battle in Ben O'Higgins Nat. Park), I had four incredible friends join me to complete the W Trek. 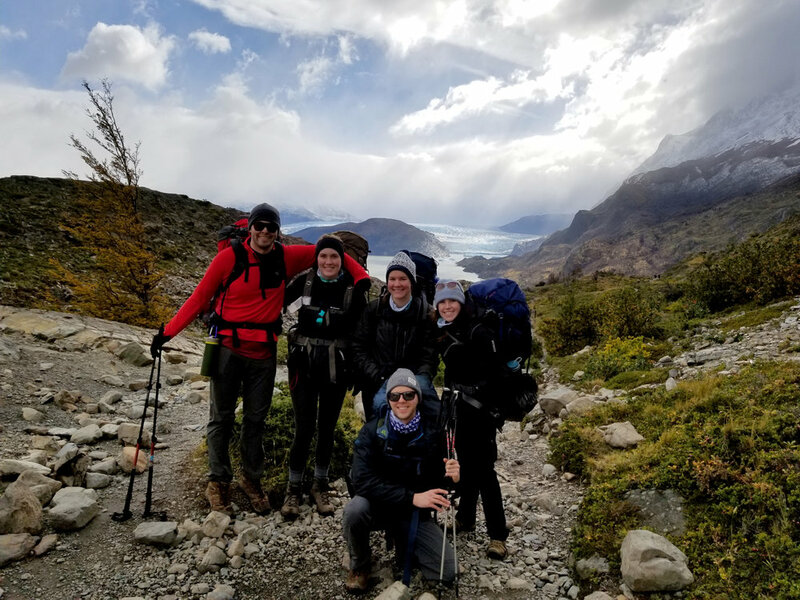 Along the way, we enjoyed more than our fair share of red wine evenings, empanada sampling, stargazing, cold hikes, glaciers, Indiana bridges, and new friends. 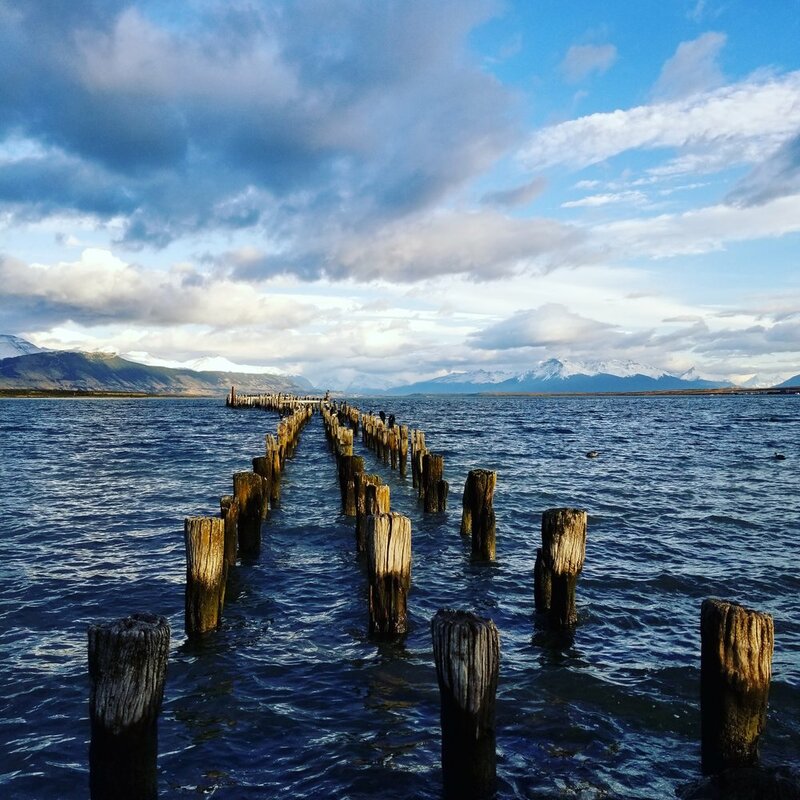 While spending 10+ days in Puerto Natales, I found a few spots and must-dos. Keep reading below to find out my work-hard-play-hard favorites for this end-of-the-world destination. The W Trek (shaped like a W) is a perfect option for trekkers of all experience levels. It’s a 5-day pilgrimage that takes you past glaciers, wild yellow fields, cerulean lakes, snow-capped peaks, and finally to the other-worldly Torres towers that the park is known for. Though the trek is not technically difficult and there are huts to refuel (or grab a pisco sour) at along the way, the elements are the wildest part. Prepare for 100km winds, rains, snow, rainbows, and glorious sun all in one day. It's the elements (not the terrain) that will test your limits. I recommend going in late March to Mid-April when the crowds start to die down and there are less jean-clad tourists taking day-trips into the park. To truly get off the beaten path and test your limits, opt for the “O” trek, a 4-day extension of the “W” trek, and a 9-day adventure in solitude, natural beauty, and wild bliss. You won’t see any tourists in jeans or hipsters posting insta-selfies on this route. The squad + our new friend from the netherlands after our pitch-black morning trek to the Torres towers. Hot Tips: Attend the pre-trek tutorial at Erratic Rock in Puerto Natales. How else would you find out about the local secrets...like how to protect your gear from the devilish campsite mice at Frances? Also, stay at the Chileno campground on your last night, and then wake up before sunrise to hike up to the Torres Towers and catch the first rays of warm pink light hit the granite fingers. Cold, but worth it. 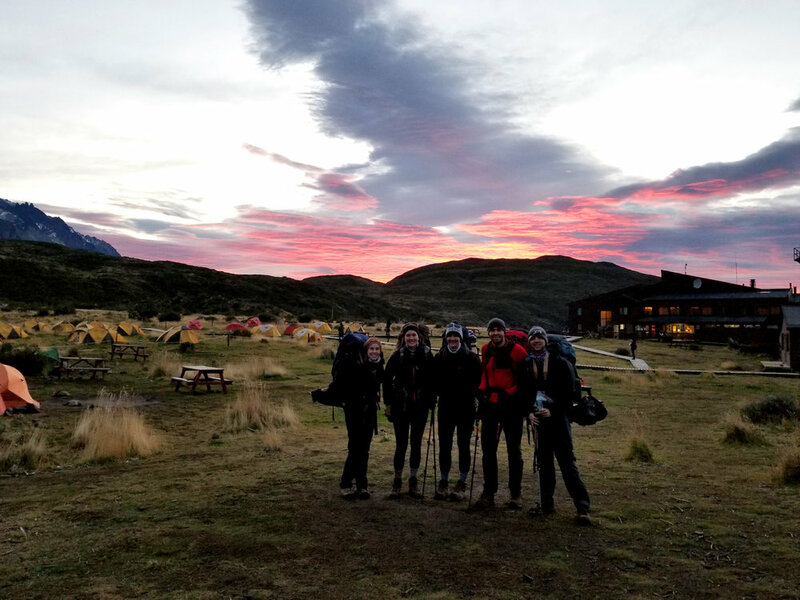 Here we are on day 2 of the W trek -- off to an early start, and catching an incredible sorbet colored sunrise. Patagonia Dulce: Perfect for a post W-trek treat, Patagonia Dulce in Puerto Natales boasts some of the absolute BEST hot-chocolate and desserts I've ever had (I went at least 4 times). It's is a down-to-earth family-run establishment with wooden chairs and a homey grandmother’s-house kind of feel to it. My Recommendation: Try the Mocha Cappuccino or the Hot Chocolate. They are both truly heavenly, and will probably ruin your hot chocolate standards for the rest of your life. Coffee Maker Bar: This waterfront cafe is the place to go for a cozy hygge afternoon. With wool pillows, long farmhouse tables, and a view of the turquoise boats sailing from Antarctica, this is the place for deep conversations, page-turning novels, and good bites. Grab a latte, sandwich, or happy-hour pisco-sour. There is a small climbing wall for ninos and an outdoor store in the same bright blue building. My pick: Latte and Veggie Sandwich. Also, you should know that regular coffee in southern South America is not good (it's all instant and really bad). Always opt for an espresso variety, this is the good stuff. The outside of coffee maker cafe, with the mountains and sea reflected in the windows! The Best Donuts in Town: Are made in a little shop on Manuel Baquedano Street (a few blocks away from the main Bulnes street). The shop does not have a name, but the owner puts out a little pink/black chalkboard sign when they are open. The outside is bright yellow. It is a very narrow room, but inside there are dulce de leche donuts (trufas) and you should buy and try them all. San Fabian Panaderia: This place had the best empanadas we found in town (and also great local baked goods). This is where the locals go, so you know it’s good. Aldea: This was hands down the best dinner meal I had in Puerto Natales or in Chile for that matter. The menu is written on a chalkboard, and it’s pricey, but it's all sustainably sourced and you can get a great meal and service here. If you're looking for a hearty-treat-yourself type of meal (lamb, stew, curry, etc. ), this place will be your jam. I am a vegetarian and the veggie curry was fantastic. El Living: Great local cafe/eatery with a hippie vibe. The owner reminds me of one of actors in flight of the concords -- kind of a New Zealand meets Jack Johnson vibe. There are lots of veggie options, smoothies, coffee, and a shelf full of books that you can read. It seems like more local people go here, so if you’re looking for a more local place, this may be more your speed! It's cash only and there is no wifi (in fact, they will actively laugh if you ask for wifi, because this is a hipster safe space, so don't do it). Base Camp Pub: This is where all the english-speaking backpackers head right after their trek. Located right next to Erratic Rock, this backpacker’s pub rocks long wooden tables, a canoe made of string lights, maps, and friendly travelers. It also boasts an Oregon flag (the owner is from Oregon). It's perfect for pizza and beer! Weskar Lodge: Owned by two fisherman families, this eco-lodge is amazing. It’s quiet and simple, but beautiful. It's located a bit out of the way (about a 15 minute walk or $2000CLP taxi ride from town), but it is so wonderful that I would recommend splitting your time between the city and here. The lodge has tall wooden beams, natural light and large open windows that highlight the Atlantic waters and looming mountains. At night they light a fire, and it smells like pure heaven. The rooms are simple, and do not have TVs. Wifi is good in the common areas, but only okay in the bedrooms. There is a sauna and an amazing restaurant with veggie options. I stayed here when I needed a quiet (non-hostel space) for the night before and after my race. I also met a New York Times Photographer here who said that Torres Del Paine and New Zealand Milford Sound are the two most beautiful places he's ever photographed. I couldn't agree more. Overall, I can't say enough good things about Weskar. The staff was incredibly friendly and even woke up at the crack of dawn to set the full breakfast buffet out for me before my race. The view from the Weskar breakfast nook! Vinnhaus: If you want centrally located, it really doesn't get any better than this. This clean, european-styled hostel is owned by a german and a chilean. It’s charming and clean, with 9 person bunk rooms and private rooms as well. All of the bunks have USB and charging ports next to them (ideal for being on the go). There is no kitchen, so that is the only downside but otherwise it’s hip and lovely with a simple breakfast and hygge vibe (wooden floors, leather chairs, owners who wear suspenders, and a small charming bar). Singing Lamb Hostel: This family-run hostel is absolutely wonderful. It's a little bit off the beaten path (about a 10 minute walk from the center of town), but the kind staff, great breakfast, and cool backpackers make up for it. After only 1 hour here, I'd already gathered TONS of hiking beta from real outdoorsy people. It was also the only hostel I stayed at in Puerto Natales that had primarily English-speaking guests. The hostel is close to Erratic Rock and Basepub (two packpacker hubs) if you need to rent gear or get that post-trek brew and slice combo. Hot tip: I definitely recommend avoiding the 9 person room here. It's just too many people and with the early bus leaving for the trek, you won't get much sleep. The 4-person, 6-person, or private rooms are definitely the way to go here. Also, make sure you try Basilio's homemade bread in the morning (and ask him about his band!). -Walk along the water: There is a beautiful path to run or walk along the water. You can see the fishing ships, and cruise ships headed to Antarctica too. The view of the old pier in Puerto Natales! -Take Photos down by the Shipyard: Head down to the water from the main square and continue to the left, towards the shipyards. There are beautiful abandoned boats and fishing equipment and graffitied walls that make EXCELLENT photos. This was a very pleasant surprise. There is also a great long red walkway to run on or bike on. The abandoned ship yard in Puerto Natales is a photographer's dream! -Le Mouton Vert: This was my favorite tiny shop in town. If you are walking along the waterfront path, you should stop in this sustainable textile wool shop. It’s in an industrial building and the entrance is pretty weird, but the textiles are incredible (and expensive!). Someday, I would like to buy a table runner from here. Thanks for reading! Next up on the backpacker circuit is El Calafate and El Chalten, two Argentinian gems. Stay tuned for my recommendations for there! ← Entrepreneurs, Creators, and Artists Who Inspire Me!